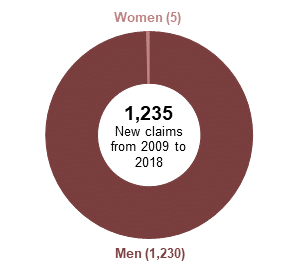 Over the last ten years, just ten of the 1,395 claims were from women. Differences are likely to reflect smaller numbers of women having worked in jobs that meet the eligibility criteria for this condition. Includes workers with new and longstanding hearing problems. Estimated using three years of the Labour Force Survey from 2015/16 to 2017/18.